Addiewell, a manufacturing village in West Calder parish, Edinburghshire, on the verge of the county,near the Cleland branch of the Caledonian railway, one and a half miles WSW of West Calder. It has a post office, with money order and savings bank departments, under West Calder and an Established church built in 1884. Founded about 1866 in connection with large chemical works, it comprises a great number of factory buildings, retort sheds, etc., and it looks like an assemblage of numerous factories and their appurtenances for a diversity of purposes. 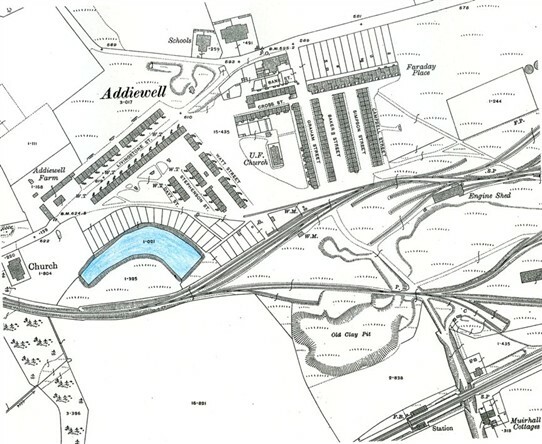 The works cover 70 acres, produce vast quantities of paraffin oil, naphtha, paraffin candles, and ammonia, and serve also as auxiliaries to the great chemical works in the vicinity of Bathgate. A public school, with accommodation for 552 children, had (1891) an average attendance of 307, and a grant of £335 17s 10d. Note: Edinburghshire is the old name for Midlothian. 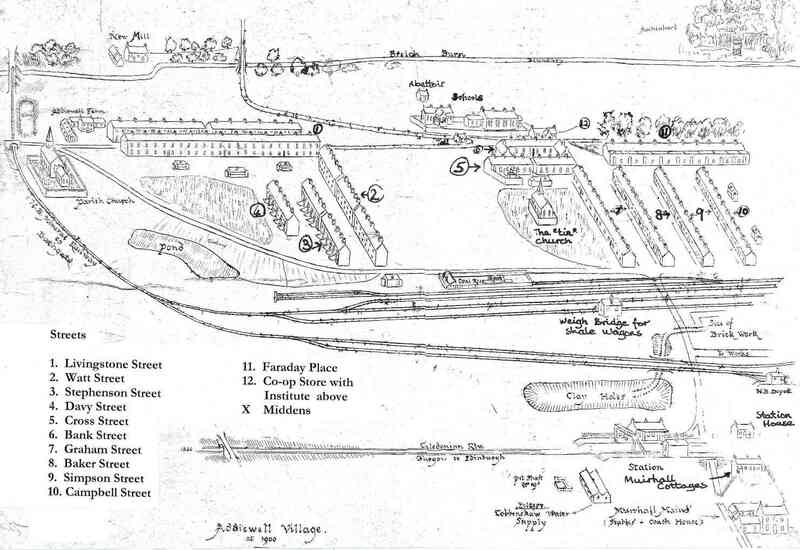 Addiewell is shown in this bird's eye view as it was about the year 1900, when the Oil Works were in their heyday, and the village was busy, smoky, smelly, thronged and thriving. 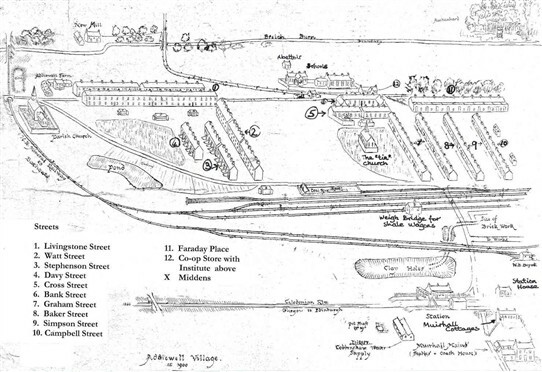 The sketch is not to scale, but look at it together with the map, which shows Addiewell a little later - in 1917. In the intervening years, the UF Church (the 'tin church') has been built in the Square, but little else has changed. Bird's eye view of Addiewell about 1900. Not entirely accurate as to scale and orientation, but gives a good idea of what the old village looked like. This page was added by Sybil Cavanagh on 25/04/2012.